The earth is endangered. The only chance for humanity to survive, is to travel a instrumental journey to a new galaxy and explore the planetary systems. Are you courageous enough to join us on board of the spaceship "sonic access"? The "Sonic Access Tour 2017" will guide you through space and time. You will experience adventures and overcome dangerous situations on your interstellar trip. Hopefully you will arrive healthy and safe on earth again. Your journey will last more than 27 years, but you will spend most of that time in your interstellar sleep capsule.... if everything will develop as planed. Be courageous and be part of that journey, let us take you on this audible adventure, which you might not have experienced like this before. On this journey we will offer you a unique instrumental concert. You will wear high tech headsets with outstanding sound, independent of your seat position. You will be able to adjust your volume as you like individually. 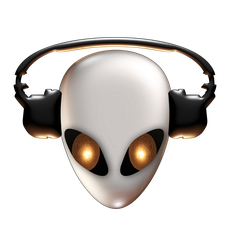 Only Spacetravelers will be able to listen to the music, which means that residents, pedestrians and aliens will not be able to follow the concert. We will use binaural sounds. With this sounds in comparison with stereo, you will have the feeling, that things will not only move from left to right, but also around you. The simulation of a human face by a special software will filter specific frequencies, which are cut out naturally by your face and nose. This way, you will experience a 3 D sound effect. Born in Star System Passavius in 1969. Musician since more than 30 lightyears and also star pilot in space ambulance. He is founder an developer of the "Sonic Access Spacetravel Agency". By business based in starsystem Ratisbona most of the time. He plays the space guitar, the supersonic bass and combines both instruments with the starlooper to a complete audible star journey. Born in Star System Trie-Star in 1983. Studium for drums and spaceship technology at "Casa della Musica - Scuola di Musica 55". Trainer for drummers and spaceship pilots in Star System Ratisbona since 2015. With almost 28 light years of space drumming flight experience, is well known as one of the safest space traveller of the whole galaxy. Born in Star System Trie-Star in 1985.
studium for classic guitar with a additional graduation in computer music at the conservatory tartini in trieste, Italy. responsible for software programming as well as the technical fine-tuning of the spaceship "sonic access".